You absolutely must see the 2004 Big Dog Bull Dog for Sale in person to appreciate the beauty of the Ostrich skin seats and the silver,black and blue bent sword paint job and when its running you can feel the power of the 117cubic inch S&S motor. The custom motorcycle also has a new clutch, computer brain, a removable back seat, battery, speedometer.240 and a new rear tire. The Big Dog Softail motorcycle has been ridden 9500 miles and looks runs and sounds great. As it has always been garage it looks almost new. This custom motorcycle is great for both long or short trips. If you're interested in the Bull Dog you may reach leave your questions and contact information in the space below provided by Strike Lightning for listing Used Motorcycles for Sale and the owner will get back with you as soon as possible. Strike Lightning would also encourage bikers to submit a review of the 2004 Big Dog Bull Dog for Sale to help potential buyers make informed decisions and to benefit the biker community as a whole. 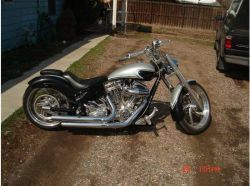 The 2004 Big Dog Bull Dog motorcycle for Sale is located in Denver, Colorado in my asking price is $13,900.00.